So I’m relieved to report that a new leap in high-end camera tech is replacing the big honkin’ lens with something much more manageable: a bunch of small lenses, plus smart software. 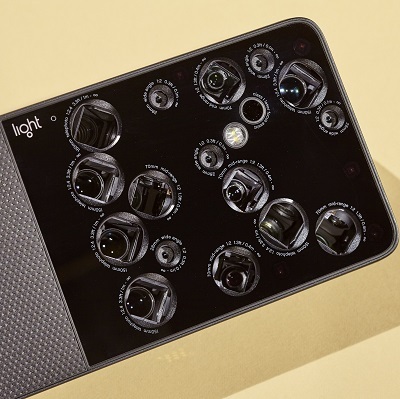 That’s the big—or, rather, little—idea in a $1,950 camera that goes on sale Wednesday from a startup called Light. The slim L16 weighs less than a pound and fits in your back pocket, yet packs 16 lenses and sensors (yes, 16) that work together to capture a single holy-guacamole 52-megapixel shot. How nuts is 52 megapixels? Most phone cameras have 12; even a fancy DSLR captures around 30. An L16 photo I took of the Golden Gate Bridge covers the entire span, yet is detailed enough to spot a single person peering over the rail. It’s part ultimate travel camera, part spy gear. Beyond all those pixels, the alien-looking L16 has a few other far-out capabilities (though shooting video isn’t one). Slide your finger up on its touch-screen view finder, and an optical zoom brings you five times as close. After you’ve snapped a photo, you can use the L16’s software to change the level of background blur, and even the focus. With the L16, I’ve taken more than 2,000 photos including several that I plan to print as wall posters. I know a lot of photographers who would benefit from the L16 and a few who’ve been patiently waiting for this first model. For now, I’d say only the adventurous should buy now—Light is still working out kinks in focus and speed, hopefully all through software updates. Still, my field experience with the L16 proves that Light’s crazy idea actually works and is poised to shape the future of photography. What’s radical about the L16 is that it makes camera software as important as the hardware. With most pro cameras, physical size matters most. The larger the sensor, the more light you capture. Larger sensors need larger lenses. The L16 needs light, too, but pulls it in from that lens array that makes it look like a cockeyed spider. When you press the shutter button, the camera grabs different perspectives—some are wide angle, others are long distance, two are black-and-white. Just make sure a stray finger doesn’t block one of the views. Then comes the software magic. The L16 quilts these overlapping shots into one megapicture, with more data than cameras twice its price. On the camera, you get a low-resolution preview; with a Mac or PC, you can offload your 150MB files and “develop” them, even exporting raw files to edit in Photoshop. I was initially dubious about this stitching operation. But I pored over my shots and couldn’t spot many errors. Light plans to keep refining its software, so if you develop the same shot again in the future, it could get even better. There’s a trade-off: Because of the way the L16 tiles telephoto shots on top of wide-angle shots, the resolution can be higher at the center, and dip when you zoom. And Light’s software has another role typically reserved for hardware: setting the depth of field. On a DSLR, you choose an F-stop before shooting to get an artsy background blur effect, like on portraits. The L16 uses depth data collected by its stereovision lenses to recreate the effect in software, entirely after the fact. Sometimes, it didn’t quite get the edges right, like around hair, but there are fine-tuning tools to fix that. The software even lets you make micro adjustments to the focus point—a function that saved one of my favorite portraits. For serious photographers, many of whom have been anticipating the L16 since its 2015 unveiling, the question is: Can it actually replace a trusty DSLR? It can, if you’re patient. I have taken some absolutely gorgeous shots with the L16. Having all that resolution made me seek out high-up vistas and other detailed scenes that reveal new stories the closer you look. Because of the camera’s compact size, I was able to take it on a serious vertical hike and other places I’d never drag a DSLR. The L16’s battery always lasted through a long day of shooting, and there’s built-in storage for some 1,500 massive shots. But my initial L16 shots stank. Perhaps because it looks so much like a smartphone—it even runs Android—I was trying to use it like a smartphone camera. Much of what I got was out of focus. Night shots were a blur. And working with such large files in Light’s editing software was a struggle at times, even for my top-of-the-line iMac. Then I slowed my roll. I pulled out my tripod, and the shots improved noticeably. I learned to tap on the view finder where I wanted it to focus, and wait for it to turn blue before pressing the shutter. That can take an excruciating second and is especially challenging when shooting a moving subject. The L16 can’t auto-track a face, at least not yet. Zooming in also takes a very deliberate swipe of the finger—not as fast as twisting a DSLR lens.